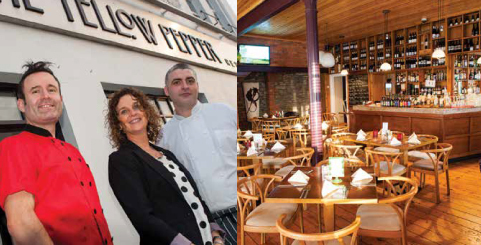 Carol Meenan and Kieran Davis, proprietors of the Yellow Pepper Restaurant, celebrate over two decades in the restaurant industry. Based on a foundation of an old shirt factory, this rustic restaurant encompasses the freshest of ingredients with the best value for customers. Many enjoy the amazing atmosphere that this venue creates as a backdrop for an excellent dining experience. 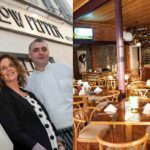 The couple have a simple, shared food philosophy, “100% of everything that we spend goes into the local economy.” Carol explained how Letterkenny is a great base for tourists to travel around the rest of the North West and how they love the ethical features that the Yellow Pepper Restaurant provides for diners. Kieran himself grows delicate vegetables that are often hard to buy and difficult to transport. “We have an abundance of vegetables and soft fruits in summer time, the greens are organic and picked daily by myself, so we design a lot of dishes from that,” he described. Another addition to this venue is their very own aging room that allows the Chefs’ to buy meat on the bone for dry aging and wet-aged meat straight from the factory. This is all to do with their ethos and keeping the customer in mind, extra value can be offered to the customer coupled with the extended use of homegrown vegetables. “The idea is that we have an advantage, price-wise and we can pass that onto the customers so that we give really good value,” expressed Kieran.